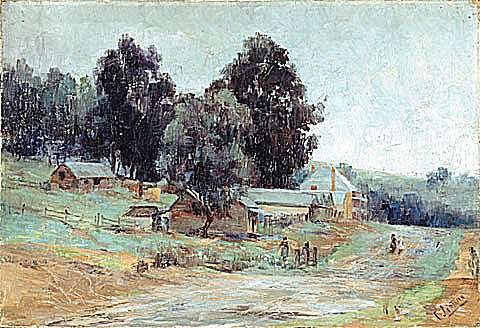 Clara Southern painted this work from close to where Webb Street and Main Street, now Yarra Street, Warrandyte intersect. Her view is from the north side of the street, looking towards the west. The substantial two-storey building on the rise in the distance is ‘The Grand’ Hotel, which was constructed in 1895-96 on the site of the old ‘Anderson’s Creek Hotel’. ‘The Grand’, was owned at this time, by Francis Trezise. ‘The Grand’ still stands today, although considerable modifications have been made to the original building.